Stair for loft bed which can also be used as a furniture itself. 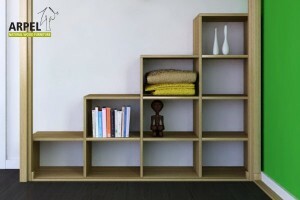 Available in various depths, the KU-BE is a functional stair with containment boxes that can be equipped with drawers. It can be also customized. Wall handrail for KU-BE stair. It is useful to facilitate the daily movements inside your bedroom. Desk in solid beech wood for KU-BE loft bed. It is available in various dimensions depending on the bed width. It is possible to put the desk along the width or along the length of the bed. Grid in solid beech wood for KU-BE loft bed. It is available in various dimensions depending on the bed width. It is possible to put the grid along the width or along the length of the bed. Shelf in solid beech wood for KU-BE loft bed. It is available in various dimensions depending on the bed width. It is possible to put the shelf along the width or along the length of the bed. Storage cube for your desk and not only! The cube, infact, can easily be put on any grid of your loft bed as a perfect containment area. It can be equipped with a useful drawer. 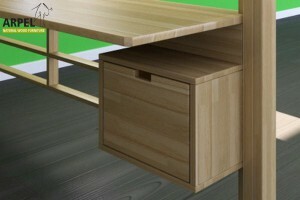 Storage cube with drawer for your desk KU-BE and not only! 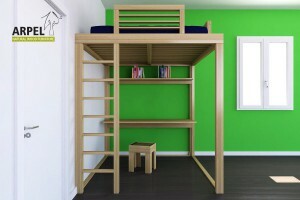 The cube, infact, can easily be put on any grid of your loft bed as a perfect containment area.